We enjoyed an excellent turnout with generally excellent weather - though it was very chilly in the morning and very breezy in the afternoon! Team Vehicles got with the program and got several of the vehicles running and exercised a bit. The Indian is still not quite ready... it needs compression seals in the head plates as well as a gasket or two in the carb and manifold. But it is extremely close! Team Vehicles (John and Johnny Bush, Wally Bush, Doug Hortvet - and forklift help from Terry Bledsoe) pitched in to help John Van Den Eynde get as much done as possible as well as help properly store parts while John is gone. Much of the remaining work was done on the Thomas-Morse wings! Tom Miller had spent a couple days on Spring Break working on preparing T-2 wing panels for the coveringprocess. Some repairs were completed and the wings varnished, mostly. Tom had set up shop in the attic, and had two wing panels laid out up there! Tom, with a little help, completed varnishing several wing panels up there. 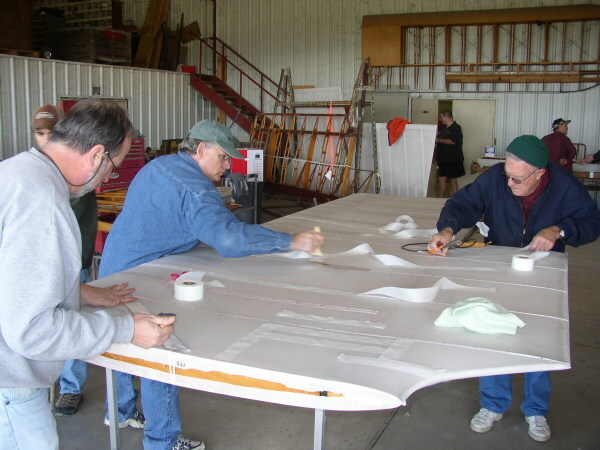 In the main shop area, several folks (Jon Baker, Art Wilson, Nick Medrano and Greg Solberg) started taping the remaining T-1 upper wing panel and completed that job. Another group (Joe Bruno, Ron Marcotte, and Don Larson) applied the cheescloth leading edge covering to a T-1 lower wing panel and then covered the wing, shrank the fabric and got on at least one coat of dope. So... the rib stitching team will have something to do next workday! Dave Miller spent part of his day making about 45 old-fashioned drain grommets for the Thomas-Morse airplanes. Clipping fabric to dimensions, fraying the edges, punching the holes and crimping on the brass grommets. 45 Times!!!! So we'll have those to add to the tail surfaces and wings as we go forward.